Carr, Leah. 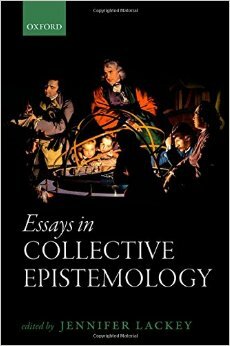 “Review: Essays in Collective Epistemology.” Social Epistemology Review and Reply Collective 4, no. 5 (2015): 29-32. To address Essays in Collective Epistemology, edited by Jennifer Lackey, I will provide an overview of what collective epistemology involves (based almost entirely on what I have learned from the book) and include a brief chapter-by-chapter digest of the essays themselves. Essays in Collective Epistemology covers a number of issues in the field and might serve as a useful introduction to the field for prospective graduate students or others looking in from outside the field. At times in conversation, we may attribute states of belief, knowledge or other intentional dispositions to collective entities. Entities such as committees, governments and organizations are often attributed these states in regular discourse. For example, one commonly hear statements like “Apple believes iPhone 10 will be the best iPhone yet” or “The Australian Research Council knows about the current Federal Government attempts to reform Higher Education”. We uncontroversially ascribe these kinds of epistemic states to individual agents. But when we attribute such states to collective entities, what are we really doing? Some people argue that such attributions at the level of the group are merely shorthand ways to express the epistemic states of a significant number of individual members of a group. For example, when we say “Apple believes iPhone 10 will be the best yet”, according to this simple reductionist view, we are really saying that “every member of the Apple Executive believes that iPhone 10 will be the best yet”. But some people disagree with this simple reductionist view, claiming that when we attribute such epistemic states to a group, we are indeed talking about something different, something about the group itself that depends on its individual members in some way, but does not simply reduce to the epistemic states of individual members themselves. Motivating this view are numerous difficulties that emerge when one attempts to aggregate the epistemic states of a group’s membership. Empirical counter-examples demonstrate that there are occasions when we can meaningfully attribute belief or knowledge to a group when that same belief or knowledge is lacking amongst the group’s individual members. One approach that illustrates this possibility, and works with our iPhone example, is Margaret Gilbert’s “joint commitment” model. Let’s suppose that when consulted privately, and off the record, all but one of our Apple executive members express dissatisfaction with the iPhone 10. Due to the terms of their contract, as representatives of Apple, each executive will still make a “joint commitment” to the view that the iPhone 10 is absolutely fantastic, “the bee’s knees”. The joint commitment model accounts for this split between the privately held belief of the majority of Apple executives and the publicized belief of the Apple corporation. Aside from such empirical counter-examples, logical challenges that arise when attempting to aggregate the epistemic states of a large number of individuals. Unfortunately, it is possible to generate a logically inconsistent group belief set by selecting the majority-held beliefs of a number of individuals who hold personal beliefs that are logically consistent. Such problems associated with belief aggregation and the simple reductionist approach might require one to abandon the very idea of a substantive conception of collective epistemology as absurd. Yet, these problems might motivate one to tell a different story about the composition of groups that goes beyond simple aggregation. Alexander Bird’s essay, “When is There a Group that Knows?”, offers a distributive cognition account that attempts to give an account of the epistemic state of the scientific community. By describing the way the scientific community works together as functional components in a total system, Bird renders plausible the notion that the scientific community is subject to substantive epistemic states distinct from its mid-level component parts (disciplines) and the understanding of individual scientists. But even if we accept such a possibility, that groups can be the substantive bearer of epistemic states, questions remain about whether we mean the same thing by individual agent belief and collective agent belief. It could be the case that there is something slightly different about the way use words such as “belief” or “knowledge” when applied to groups as opposed to individuals. Alternatively, perhaps some of the trouble we run into when talking about the epistemology of collective entities is a result of exporting concepts that work perfectly well at the individual level, yet not so well at the collective level and, so, we might need to develop some conceptual tools to improve the way we discuss the epistemology of collective entities. These are just some of themes addressed by Essays in Collective Epistemology examines. I will provide a brief run down of the essays presented in the collection. In Chapter 1, “Social Process Reliabilism: Solving Justification Problems in Collective Epistemology”, Alvin Goldman explores a “social process” reliabilist approach to grading the reliability of collective knowledge, where the grade of justifiedness will be a function of the reliability of a group’s individual members and the social processes that aggregate member knowledge in a substantial material way. In Chapter 2, “When Is There a Group that Knows? Distributed Cognition, Scientific Knowledge and the Social Epistemic Subject”, Alexander Bird offers a non-summativist approach that offers seeks an alternative to the “joint commitment” model by shifting to a “distributive cognition” approach, an approach he sees as advantageous when it comes to describing the epistemic agency of the scientific community. In Chapter 3, “A Deflationary Account of Group Testimony”, Jennifer Lackey offers a thorough consideration and refutation of various arguments that motivate an inflationary account of group testimony, showing that the transmissibility and reliability of knowledge are sufficient for testimonial success from the standpoint of the hearer, and so refuting the need to assume a particular state of belief or knowledge on the part of the tesifier. In Chapter 4, “How to tell if a Group is an Agent”, Phillip Pettit presents two conceptions of agency: non-personal agency, a representation guided system that can re-organize its environment in accordance with a goal; and personal agency, a sufficiently complex system that can alter its attitudes towards its environment, and so may be subject to moral endorsement or repudiation. Pettit argues that while we may have trouble ascribing non-personal agency to groups, they are strong candidates for a conception of personal agency. In Chapter 5, “The Stoic Epistemic Virtue of Groups”, Sarah Wright shows how the Stoic concepts of skopos, the standard of success of our actions; and telos, the standard according to which measure our lives, can be easily extended into an account of the epistemic virtues of groups, where the skopoi of a group are true beliefs held by the group and its individual members, and the telos of groups cover the overall aim of believing well. In Chapter 6, “Disagreement and Public Controversy”, David Christensen takes a conciliationist approach that seeks to determine when it is rational to accept disagreement between two or more parties based upon a “disagreement independent assessment” of the epistemic credentials of the other disagreeing parties. Christensen then extends this account to the political domain, showing how his Independence-based Conciliationism does not entail a reduced confidence in one’s own beliefs, as far as certain public controversies are concerned. In Chapter 7, “Social Roots of Human Knowledge”, Ernest Sosa proposes the notion of knowledge as an apt judgment when attempting to discriminate true from false beliefs. When attempting to ascribe knowledge to an agent, one will consider the competence of the agent and the reliability of the belief. However, if one admits that complete certainty is too high a threshold, one that would exclude much of what commonly passes for knowledge, then the question remains: what sort of reliability threshold should knowledge assertions be held to? That is, when is judgement about belief “reliable enough” to count as knowledge? While it might be difficult to establish an exact threshold, Sosa considers how the encroachment of some pragmatic concerns might help to roughly indicate where the threshold might lie. He considers context-specific encroachments that might motivate a variable threshold on the one hand, but instead weighs in favour of an invariant threshold answerable to the socially generated norms of assertion that serve the information-sharing needs and interests of that society. In Chapter 8, “Belief, Acceptance, and What Happens in Groups: Some Methodological Considerations”, Gilbert and Pilchman suggest that one mistaken methodological assumption that appears in collective epistemology is that collective belief is assumed to be in some way identical to either: individual belief, understood as mental content accompanied by credal feelings; or individual acceptance of belief, understood as judgmental assent towards belief that would serve as a basis for action. The methodological error when analysing the concept of collective belief is that it may deserve treatment as a separate concept, yielding a conception of group belief that is identical neither to individual agent belief nor to acceptance. In Chapter 9, “Individual Coherence and Group Coherence”, Rachael Briggs, Fabrizio Cariani, Kenny Easwaran and Brander Fitelson take a formal epistemology approach to the logical difficulty facing of majoritarian belief aggregation, in which a logically inconsistent group belief set may be derived from logically consistent belief sets held by a group’s membership. Briggs et al. define a weaker coherence requirement that draws on a probabilist approach to the coherence of credences, presenting an alternative norm of coherence to assess collective belief, which has less of the shortcomings of the stronger norm of consistency. In Chapter 10, “When to Defer to Supermajority Testimony—and When Not”, Christian List proposes an approach whereby the degree of consistency can be quantified—what he defines as k-consistency—according to the number of sub-sets into which a belief set must be divided in order to become fully consistent. Using this notion of k-consistency, List shows that a supermajority threshold will produce a consistent group belief set by stipulating that only beliefs that are held by k-1/k members be allowed into the aggregation procedure. Essays in Collective Epistemology offers a solid introduction to a number of philosophical issues and approaches that pertain to collective epistemology. The notion of collective epistemic agency is not entirely new to me but, until this point, I have mostly encountered what might to be described as the inverse approach to the one the book exemplifies—the kind of approach often attributed to Michel Foucault where one holds society as ontologically prior to the individual. The problem for one who takes society as a starting point is to explain how individual agency emerges from social processes and norms. In many ways, the metaphysical scruples about inflationary “collective minds” seem to echo the same metaphysical scruples the eliminative materialists represent in the philosophy of mind. I am left with the question regarding whether we can avoid being inflationary at some level—either at the level of individual agent, or at the level of the collective. It would not surprise me at all that the place where your scruples lie has a lot to do with the conceptual starting point of your analysis. But as far as a more constructive social or political project is concerned (and one might look to John Burnheim’s alternative model of democracy here, for example), Essays on Collective Epistemology looks to me like an excellent catalogue of approaches to some of the more complex, even technical, challenges such normative projects face. There might be a connection between “collective belief,” in the sense that there is identical content in the minds of all members of some collectivity, and the religious notion of faith as a gift from God. If God is imagined as having the power to put identical beliefs (faith) into the minds of those to whom She gives this supernatural gift, then it seems to be an easy move to assuming that natural processes of knowing can also result in there being identical cognitive contents in the minds of the members of a community. This is also consistent with the conduit metaphor of communication, according to which the sender of a verbal message “puts into words” the content of what he wants to communication, and the receiver of the message “unpacks” the meaning from the “package” of words plus meanings. This seems to me to be analogous to Plato’s position (or to the position often attributed to him). Ideas are the really real, out there, independent of anyone who actually thinks them. Human minds (or souls) “participate” in those all those ideas, but we have to work to remember them consciously. To the extent that members of a collectivity have remembered what their souls participate in, they share identical cognitive contents.